Think you’re a Bears fan? You say you bleed blue and orange? 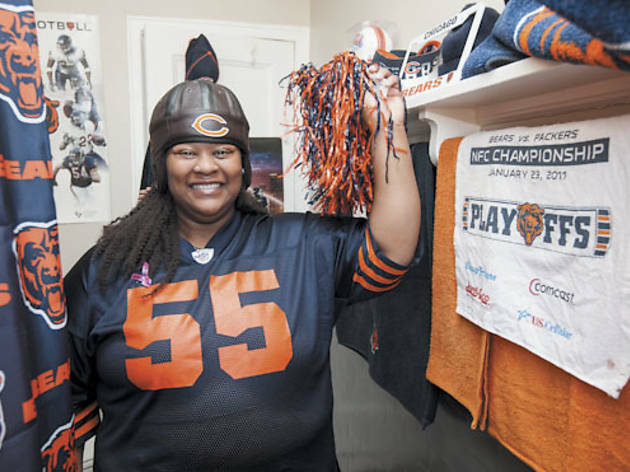 Well, there is no greater believer than a convert, and Dacia James, who didn’t have football at her high school or college, was converted in 2007. “The moment I walked into Soldier Field, I was overwhelmed with everything that was going on,” says James, 32. From that point on, she was hooked. 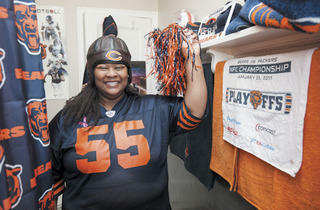 She’s been in the Bears’ locker room twice as a member of the 4th Phase Fan Club. She’s had her photo taken with Staley, the Bears’ mascot. When she met Da Coach at his restaurant in May, she cried. Is she hosting a Super Bowl party this year? Not a chance. This super fan wants to watch the game.